Bio Notes: Offices in Edinburgh, London, Bristol and Manchester. Known as the Ministry of Works from 1943; renamed the Ministry of Public Building and Works in 1962, and absorbed into the Department of the Environment in 1970, although most Works functions were transferred to the Property Services Agency (PSA), which was created as an autonomous agency in 1972. John Peter MacBryde Planning Officer Official title was 'Planning Inspector'. Jasper Wager 1877 After 1899 Assistant In London office. Herbert Read 1882 1883 Assistant In London office. Archibald Bulloch 1904 1919 Assistant In London office? W Grant Watling 1930 * Initially in Edinburgh and then in London. C L Stuart Before 1930(?) Before 1930 In London office. Harold John Muir Before 1939 30 November 1970 Assistant Initially in London office (Storey's Gate, Westminster); later elsewhere including latterly in Leeds. George Douglas Hamilton 1957 * In Leeds office. Alfred Alexander Coutts c. 1979 Director Director of Overseas Services. Paisley Abbey Paisley Renfrewshire Scotland Restoration with Matheson as Architect in Scotland. 1859 Royal Botanic Garden, Old Palm Stove Inverleith Edinburgh Scotland Iron shafts replaced stone mullions (as architect for Scotland in the Office of Works) and replacement of prismatic roof with a dome. 1898 Post office, Hill Street Arbroath Angus Scotland With W W Robertson as chief architect. 1900 Kirkcaldy Post Office Kirkcaldy Fife Scotland With Robertson as architect in charge? 1908 Post Office Oban Argyll Scotland With Oldrieve in charge. 1922 Arbroath Abbey and abbey buildings Arbroath Angus Scotland Gradual restoration of Abbot's House intially and later Guesthouse range. 1927 Parliament House, Supreme Courts of Scotland Edinburgh Scotland Unspecified maintenance work. 1933 Hall & arcade Glasgow Scotland Unclear what the roles were in this building - both given in 'Architect & Building News'. 1940 National Library of Scotland Edinburgh Scotland Further involvement? 1942 Broughty Castle Dundee Scotland At SE corner of tower house addition of brick built defence post. 1943 Primary School Thornton Fife Scotland Temporary school buildings - in conjunction with Haxton & Watson and Scottish Education Department. c. 1943 Burntisland Primary School Burntisland Fife Scotland Temporary school buildings - in conjunction with Haxton & Watson and Scottish Education Department. c. 1943 Denbeath Public School Buckhaven and Methil Fife Scotland Temporary buildings - in conjunction with Haxton & Watson and Scottish Education Department. c. 1943 Kinglassie Public School Kinglassie Fife Scotland Temporary buildings - in conjunction with Haxton & Watson and Scottish Education Department. c. 1943 RC School Buckhaven and Methil Fife Scotland Temporary buildings - in conjunction with Haxton & Watson and Scottish Education Department. c. 1943 Wemyss Public School East Wemyss Fife Scotland Temporary buildings - in conjunction with Haxton & Watson and the Scottish Education Department. May 1945 Two Swedish Prefabricated Houses, Tannockside Lanarkshire Scotland Ordered by Ministry of Works from a Swedish firm in Stockholm. 1951 Montrose House Glasgow Scotland Designed before war but built at this time. 1963 Royal Botanic Garden, glasshouses Inverleith Edinburgh Scotland With Pearce and Johnson as architects in charge. 1964 St George's Church Edinburgh Scotland Adaptation of church for use as record office - with R Saddler as architect in charge. 1982 John Watson's School Edinburgh Scotland Worked with Robert Matthew Johnson Marshall & Partners on conversion. © All rights reserved. Courtesy of David Ross. Photo taken 1956. 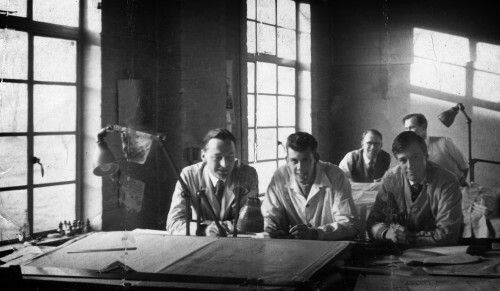 From left to right: John Chalmers, Robert Greenoak (technician), David Ross. At rear Thomas Gibson and half-hidden Stan Lambert.